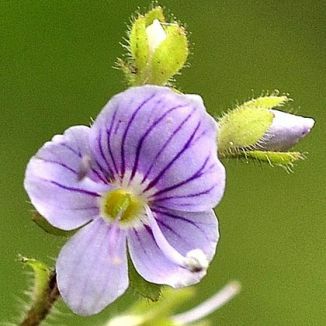 This is a delicate little perennial, very like Germander Speedwell except that its stems have little hairs all round them, whereas Germander Speedwell's stems only have two little lines of hairs up them. Also its slightly smaller flowers (7-9mm across) which have 4-lobed corollas, are more of a pale lilac colour than blue. These are held in loose spikes and bloom between April and July. The oval, toothed leaves are pale green, with long stalks. The plant, which grows about 20cm high, creeps on stems which root at nodes and is usually found in damp woods and thickets. 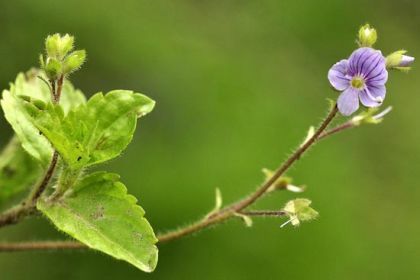 It is a native plant and belongs to the family Plantaginaceae. I found this delightful little wildflower in an amazing and beautiful wood full of Bluebells near Ferns, Co Wexford in May, 2009 and photographed it at that time.